« PAINTING AND DRAWING FOR ALL! C A R V E is a fun and unique class that turns wax to silver, let us show you how to CARVE a bespoke ring in jewellers wax in just two hours. 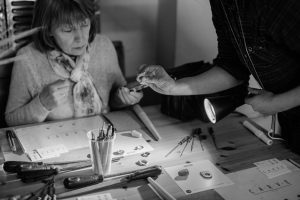 CARVE classes are run by Katie Lees Jewellery and Kate Pickering. Combined they have over 10 years of experience. Katie creates opulent, unusual and bespoke designs for an extensive range of clients. Kate has built a reputation for supporting and promoting the jewellery industry in Scotland through her jewellery incubator programme Vanilla Ink, her countrywide festival Scottish Jewellery Week, and now with CARVE. £78 – includes all materials and final silver ring.